12/28/2016 - Here's a very simple combination of Raise the Alarm and white P/T boosting. 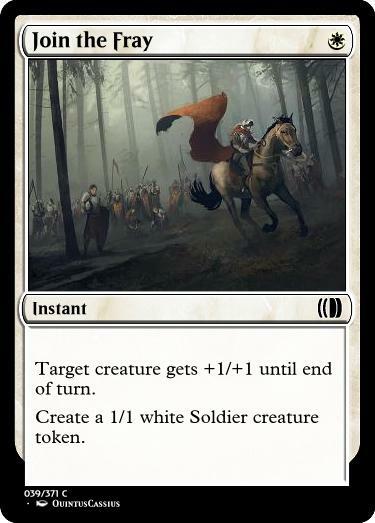 In a set that doesn't care about tokens, you'd just make this a flash creature with an ETB effect. The creature with Flash version can target itself, too, and also avoids the feel-bad of being unable to cast it on an empty board when your opponent is at 1 and you just need any creature. So they do differ in somewhat significant ways. Amusingly, the creature strikes me as a borderline uncommon while the instant is clearly common. Especially if it can target itself. Another difference I just realized: the instant is better with Heroic. Helps that the flavor is a perfect fit for Theros.